Snugpak Journey Quad Backpacking Tent. This tent is available on Amazon and I have seen it on several of their global stores. So just to know that you can save on shipping if you order it in your regional Amazon store. 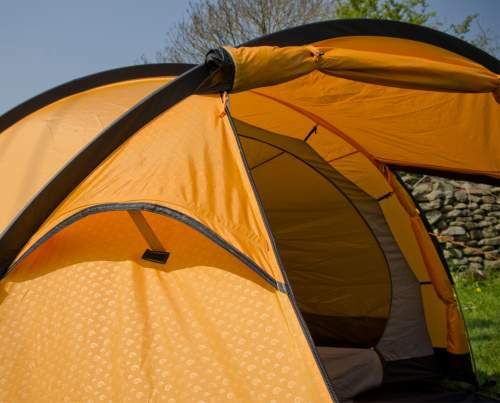 This Snugpak Journey Quad is the largest in the new tents series they launched recently. There are also tents for 3 people, 2 people, and a solo tent. Those who are used to the green tents from this brand, like this Scorpion 3, might be surprised with this new choice of color. 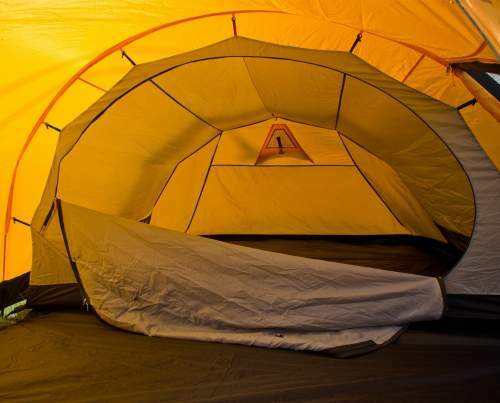 This Quad tent is the only in the series with the Flysheet-first design. If you are not familiar, this means that the poles are from outside (see the pictures) and when you pass them through sleeves, you raise the tent so that the inner area is completely protected. This is not so with tents where you add the fly above the frame. So this is a good design to have if you pitch the tent in rain. This is a tunnel-type tent with three poles creating the arcades. So the structure is not-freestanding, bear this in mind when you choose your camping spot. 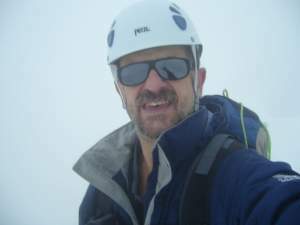 The structure is a double-layer type, with the inner tent (shown below) and the fly. But there is a huge porch in front of the inner area and this is a single-layer part of course. You also have a floor in the porch zone. This is just the footprint which extends from under the inner tent through the porch area (visible in the picture below), so it is not linked-in as you would expect. This is a waterproof fabric to protect your backpacks and other gear stored in the porch area, very useful indeed. Inner view with the vent on the back and the inner tent attached to the fly. The tent has two doors on its huge vestibule, one rolls up and the other to the side, so this all adds to its comfort and versatility. The inner door is huge and you can see it in the picture above. The vestibule may be high enough to sit underneath it in a very low camping chair, and you can use it for cooking as well when it is raining outside. In fact, the manufacturer did not even mention this option which is obviously a bonus here, so you do not have to use the inner tent. This can be useful as a shade on the beach or on a picnic. Size-wise, they are realistic when they claim it is for up to 4 users or for 2 – 3 users with gear. The floor plan below shows you what you have here. So the inner area is 52 ft² (4.8 m²) and in the case of 4 users this would give 13 ft² (1.2 m²) per person. 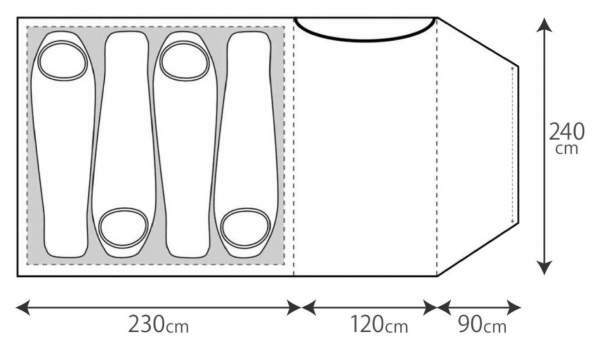 This is doable when you see the dimensions of the inner tent. But there is also a vestibule and my estimate is that it offers 48 ft² (4.5 m²), so the total covered area for your gear and you is 100 ft² (9.3 m²). I would still not go over 3 users in such a space; in this case, the users can sleep oriented in the direction of the door and not transverse to it as in the picture below. The tent is perfect for a couple as a basecamp and camping tent. Seasons-wise & climate-wise, the tent is with a huge waterproof rating, with very good aluminum poles, it is low-profile and aerodynamic, with a footprint to protect you from the groundwater, with several vents and mesh for ventilation. 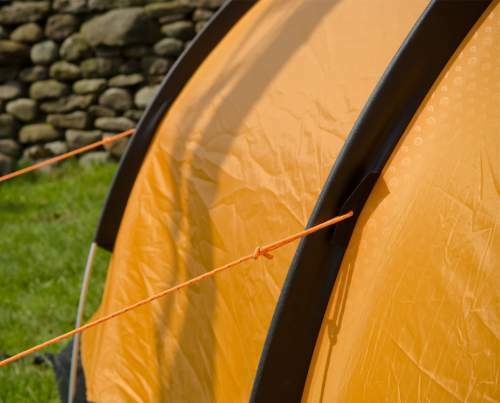 So this is a 3-season-plus tent which will protect you in any weather conditions. I would still add that it is better suited for a cooler climate, the inner tent is quite enclosed and you have to rely on vents. Weight-wise, with its 5.4 kg (11.9 lb) of weight, this is not something for the trail although on Amazon they describe it as a backpacking tent, but it can be carried on shorter hikes of course. If you need something for backpacking, better check my list with best backpacking tents. But the packed size of this tent is simply excellent. So it can be transported in various ways, on a bicycle, in a kayak, even carried attached to a pack, etc. I have added it to my list of best 4-person tents for car camping, but it is clearly more than that. As mentioned above, you have 3 aluminum alloy poles with press fit connections. Also in the package, you have 18 lightweight Y-shape pegs. The flysheet is 75D 185t polyester with a PU coating and 4000 mm waterproof rating, F/R material. 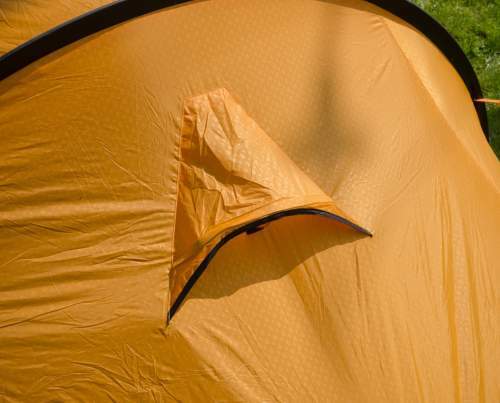 The inner tent is a 190t nylon with polyester, W/R & F/R. The groundsheet is a very durable 210t polyester with 5000 mm PU coating, F/R. So clearly there is nothing one could object here. There are two vents on the porch area and one on the back shown below. The inner tent is breathable and well separated from the fly as you can see from the picture below. There is also a mesh area on the inner door, and one on the rear side facing the rear vent. So all is in place for a crossflow and ventilation. This is the rear vent with a Velcro stiffener. One of the two vents on the porch. There are several mesh pockets on both sides of the inner tent. The carry bag with compression straps. Footprint adds value & comfort. Declared capacity: 4 people; 2 – 3 with gear. Weight: 5.4 kg (11.9 lb). This includes fly, poles, inner tent, stakes, guy ropes, stuff sack. Trail weight: 5 kg (11.02 lb). This includes fly, poles, inner tent. Dimensions: 173 x 94 in (440 x 240 cm). Inner area: 52 ft² (4.8 m²). Vestibule area: 48 ft² (4.5 m²). Total area: 100 ft² (9.3 m²). Peak height: 55 in (140 cm). Inner peak height: 51 in (129 cm). Packed size (L x D): 23 x 7 in (58 x 19 cm). I have decided to show you this Quad tent side by side with two other top-notch tents from renown brands, both in the same size range but those are dome style tents. Note that Marmot Halo 4 is much more expensive than the other two, and Wavona tent is a single layer type yet the Quad tent is still lighter. The Quad tent packs better than the other two and its area is more functional because of the single but huge porch. It is also the lightest in the group. I would dare to say that the Quad is a better option than the other two tents, but follow the links and judge yourself. So they have really nicely built this Snugpak Journey Quad 4 Person Tent, durable and reliable materials are used and this is a functional and very packable tent. But downgrade the number of users to 3 maximum. Snugpak is a reliable brand and I am convinced this tent will stay on the market for a long time. If you need a smaller tent from this series, check the Journey Trio tent which is a completely different construction. You might want to check yet another 4-person tent from this brand, Snugpak The Cave tent which is in the group of winter tents, and see also their Snugpak Scorpion 3 which a celebrated tent from this brand. Note that this is not a sponsored text and I have no relation with the manufacturer. Please use the comment box below in the case of comments or questions. I wonder what you think about the color of this tent.